This is an early post for the start of an up and coming printer rebuild. The plan is to use a Duet 32bit controller. Some of you may remember me getting a couple of Mini Kossel printers a few years back. Both of them had Duet controllers, however the mechanics and extruders had other issues. The sample shell prints I did proved very accurate, but managing solid prints caused layer slip. My bad I think as I struggled with the setup and kinematics of a delta printer, hope to revisit it at a later date. The current machine is an older Printrbot Metal Plus (they shut shop last month). It features Hiwin linear rails for XY operation and over sized recirculating bearings on the Z bars. The thing is a Prusa style machine with moving table. I am not a fan of moving table for tall delicate prints like the boat hulls, but let’s see how far we can get. It has problems with its controller and the supplied power supply was a joke, but at the time I had no idea it was dipping as the steppers all moved at once and suffered unfathomable under extrusion and layer slip. Well I know now and it’s new power supply arrived the other day, more parts inbound. I did do a mod for the hot end swapping out the oozy supplied dribbler for an E3D V6, the tests of this new hot end are looking good with direct drive extrusion. Re: 32bit controllers for 3D printing. The next BIG thing. Have you considered changing the design to a moving gantry instead of the table moving? I would think that would be relatively easy to do with linear rails... I like your thinking and approach. Joe, the conversion is needed to make use of this printer, at some time my Mini printers will reach a point where they need more than just service and they will be retired. I agree about moving gantry, I have a Core XY design using linear rails being developed in CAD, but it is a long way off reaching actual physical build. I had been looking at the coming Anycubic Chiron, but it has the moving table and still uses an 8bit Marlin controller. I should gain valuable knowledge on the controller that I can then apply to the Core XY design. I have tried to avoid building printers as I use them as a tool and hoped other engineers would have developed them further than they are now. My time is better spent in other areas, but with a limited budget I am running out of options. I dabble in precision. May explain why I'm having hard time even imagining to buy a 3D printer. What sort of options are there for stable vertical axis table and extruder on X/Y stage? Forget the printer being desktop, use a ballscrew directly under the table like a knee mill and spin the nut, use a large single Hiwin rail and block for the table guide. The printer has to have an enclosed metal chassis for rigidity. Look at aircraft spars or carbon cycle tube for the gantry design, you are looking for light very low flex. The more weight in the XY, the more inertia you have to deal with. Servos are a step too far on cost, but if cheap hybrid ones become available... The nozzle is lightly loaded, but direct drive for the filament is a must, a weight penalty on the gantry. Bowden drives have too much hysteresis for accurate metering of extrusion. The 3D printer has to be looked at as a high speed motion device, not a cnc milling machine, but still requires high prescision. My downfall is not having access to CNC machining for parts. Printed parts are OK for testing but not the finished item. My build volume aim, 300mm x 300mm, with a 400mm Z. That would make the printer about a metre tall, so mostly storage in the base. I considered this rabbit hole some time back. A 3D printer is a CNC machine. Lots is known about what makes a good CNC machine. I got as far as ordering some 20mm CRS plate with a view to making a 20mm wall box with Z rails up the inside, linear bearings in machined recesses X and Y in the lid... You get the idea. I can understand your logic Paul, but so many ways to skin this cat. The printing process is a very complex waltz, whilst writing your name in the snow. I’m sure a 5 axis cnc machine would be great for 3D printing... 8-( however, I don’t have the room, never mind the budget. I have considered granite slab for the printer base, holding tight tolerance as the machine gets bigger becomes more difficult. Do you calibrate the machine for room temperature or working temperature that might be 40℃+ Insulate the internal cabinet so it doesn’t upset the external chassis. Look into low expansion materials, or match the materials you are forced to use such as the bearing rails. Is 20 micron feasible for this volume machine, assuming <10 micron stepping. I will be wrestling this and more for sometime to come. Way outside my comfort zone. Please chip in Fella’s open to discussion on this one. This is the printer waiting a brain transplant. It was bought due to having the linear rails and steel chassis, on paper it looked a good one. Ahh well, maybe it still can be, the E3D hotend was machined and a spacer added so it could be a direct replacement for the old hotend. A lot of people actually print the adapter for these, but they just aren’t rigid enough for quality printing. The old hotend had no heat break, one of the reasons it constantly dribbled as heat worked its way up with no cooling fan for the Peek section. "I’m sure a 5 axis cnc machine would be great for 3D printing..."
I was more thinking of something on the scale of what we have, just replacing wobbly sheet metal frames with sturdy bolt up steel structures, machined surfaces and decent bearings. Oh and getting rid of steel+aluminium+heat wherever possible. Paul, you actually would like quite a bit of the above printer. The steel chassis is well thought out and very rigid once bolted together. They did skimp on the table bearings using 3 rather than 4 and the Z leadscrews are a bit weedy and prone to getting bent easily, as you can crash the hotend off the edge of the table... that only needs a block of alloy to fix. Aluminium table is very flat, I don’t use a heater with it for printing PLA and not sure what 60℃ would do dimensionally. I think it will do better work than the current printers once the mods are completed. Then start serious work on the core XY design. I have to admit I DID design a printer... I funded a kickstarter for a 15" class machine and later found the design they came up with sucked. They didn't want any (free) help, even though we were all in Houston!! Thus, I completely redesigned it, constrained only by the materials supplied and by plasma cut plates. I ended up making at least a dozen plate sets for other builders. I build BIG stuff all the time and use a freakish 1.2 mm nozzle. Nice resolution, but the stringing on that cat makes the fur and whiskers look real. How long does its batteries last ? That looks impressive, do you have more details. I have been considering increasing the size of my granite based prusa because I am often printing parts in section and then joining them. A frame printer in which only the head moves is IMHO the best way to go. If you are replacing the electronics have you looked at the prusa i3 mk3 gear with the EINSY rambo board. Although only 8 bit, by using the Trinamic drivers he extracts enhanced performance and features. The stall info from the drivers is used to set the zero positions so no more limit switches and nasty noises when things go wrong. 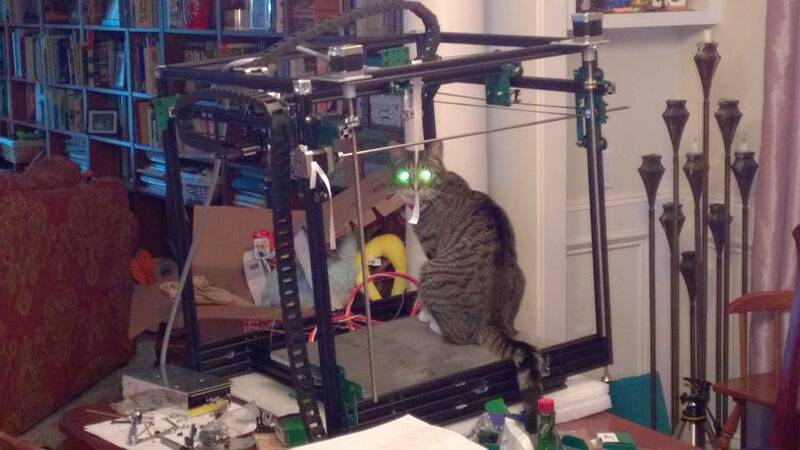 He also uses an optical mouse sensor in the extruder to detect filament presence and movement. I also like the flex bed steel sheet as a nice non messy adhesion solution. I would invest but I cannot justify the cost and it does not resolve my size issues. I will still go with the 32 bit, you are always going hit the overhead limit on 8 bit CPU, plus they can't do the maths to the same precision and this is visible in prints. We noticed it a long time back when we thought only delta printers would benefit from the 32 bit maths.